The concept of national parks is an American idea which originated in the 19th century. In 1870, the Washburn-Langford-Doane expedition was surveying the Yellowstone region, following up the incredible rumors concerning the area’s wonders. As the group sat around a campfire planning how they would divide the region up among themselves, as was their right under the laws of the day, a lawyer named Cornelius Hedges eloquently proposed the then radical idea that the area should be preserved by the government for all the people. Hedges won over his friends, and their impressive presentation to the Congress back in Washington resulted in the creation of Yellowstone National Park in 1872, and eventually the National Park Service. Certainly, few areas in the American West are as spectacular as Yellowstone, or as diverse in their attractions. Here, you will find great gorges with giant waterfalls, abundant and viewable wildlife, lakes, a vast mountain wilderness, and the world’s largest concentration of thermal hot-spring activity. (Photos, left and right) The great Lower Falls of the Yellowstone River dropping hundreds of feet into the Grand Canyon of the Yellowstone. 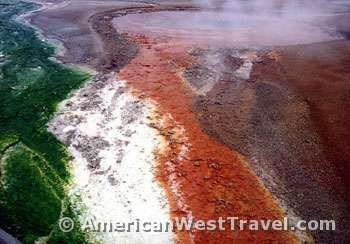 (Photo, above), Two exquisitely colored hot springs. The coloration is caused by the algae which grow in the warm runoff from the pools. In the photo, right, note the vertical lines near the front of the pool. These are actually percolating mud. The aqua color of the water is due to mineralization. The inner earth is thermally active in the park. Because the ground cover is mainly loose volcanic soil, many small vents occur through which steam escapes. 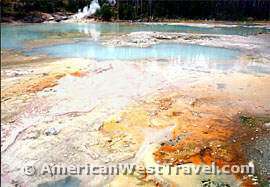 The result is an assortment of thermal features including hot pools, geysers, fumaroles, and boiling mud pots. In the thermal areas, the air has a constant smell of hydrogen sulfide and bizarre hissing and bubbling noises. 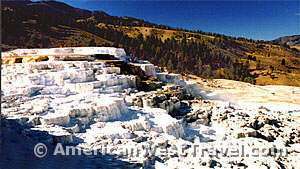 (Photo, left), Mammoth Hot Springs is the park’s finest example of travertine decoration. When a spring is located such that its water can freely flow, fantastic formations can result. These deposits are leached out of the highly mineralized water. Mammoth is not that active today. You will see only a small amount of running water and a few wisps of steam. The active areas are especially beautiful as the glazed travertine has the look of marble. One of Yellowstone National Park’s most fascinating features are its geysers. 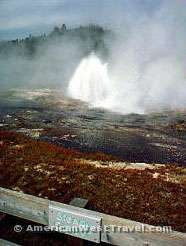 Geysers occur when there is a strong steam vent in an area of actively flowing groundwater. Water flows into the vent blocking the release of steam. The blockage causes underground pressure to build up until it is sufficient to violently eject the water from the vent. The water and built-up steam being ejected is the actual geyser. Each geyser is unique in its time interval between and during eruptions and how it acts during an eruption. The performance can change from one eruption to the next. (Photo, left), is the peak eruption of the fittingly named Giant Geyser. During its eruption which lasted about 20 minutes, the geyser actually had many different looks. (Photo, right): Visitors watch a geyser erupt from conveniently placed boardwalks. Yellowstone National Park’s most famous feature is probably the Old Faithful geyser. It is so named because of its regularity, having erupted about once an hour for centuries. (The time interval is actually between about 30 and 90 minutes.) 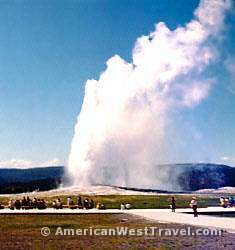 While not the biggest or most spectacular geyser, Old Faithful erupts on a fairly regular schedule and is readily accessible, making it a visitor favorite. 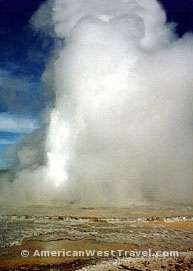 Shown right is the unusual Steady Geyser. Unlike most other geysers which erupt at intervals, this small geyser erupts steadily (hence the name) without stopping. 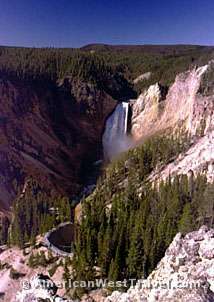 Another exciting feature of Yellowstone National Park is the presence of spectacular waterfalls. 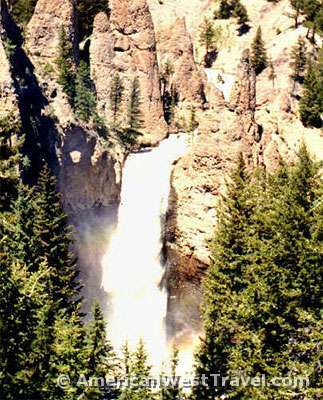 Shown here is Tower Fall, spilling down a sheer walled canyon into the Yellowstone River (Photo, left). 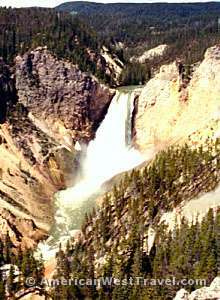 The most well known falls is the Lower Falls of the Yellowstone River shown at the top of the page. It flows into the Grand Canyon of the Yellowstone, a very colorful 1,000 foot gorge which runs for several miles. Above the Lower Falls is another large waterfall, known fittingly as Upper Falls (Photo, right). All of the falls have readily accessible viewing points although the trail to Tower Fall is sharply downhill with a steep return climb. The Yellowstone River flows out of beautiful Yellowstone Lake which has always been a favorite for boating and fishing. Fly fishing for brown trout is also available in the area’s rivers and streams. Fishing rules are quite strict in the park in order to protect fish populations (no bait, no barbs, no lead). All native fish must be released unharmed. Natives include cutthroat trout, mountain whitefish, and Arctic grayling. However there are many great fishing opportunities just outside the park for the serious fisherman. No look at Yellowstone would be complete without some wildlife photos. 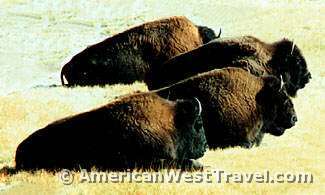 Everyone who visits the park will see herds of buffalo and elk. Pronghorns and deer are also present as well as the occasional moose. Bears are not as much in evidence now. Decades ago, bears were allowed to forage garbage and take handouts from visitors. The results were bears that were no longer wild, lots of property damage to vehicles, and lots of dangerous human-bear encounters. Today, rangers try to keep the bears far in the backcountry. Regulations are very strict concerning the securing of food and garbage. The park is home to several hundred grizzly bears and a larger number of black bears so there is always a chance of seeing one. In recent years, the park has taken the controversial step of reintroducing a small number of wolves into the backcountry. 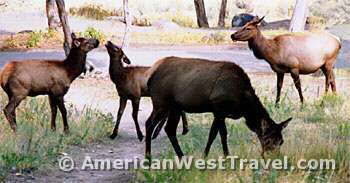 (Photo, left), A group of elk meander through a campground.